Motorcycles, 11-2 Visible exhaust smoke. The requirement is based on Land Transport Rule: Vehicle Exhaust Emissions 2007. The aim of this rule is to check that vehicles are not gross polluters. A Ministry of Transport study in 2006 estimated that 1–2% of petrol-powered vehicles may be affected by this test. The number of diesel vehicles affected may be higher. 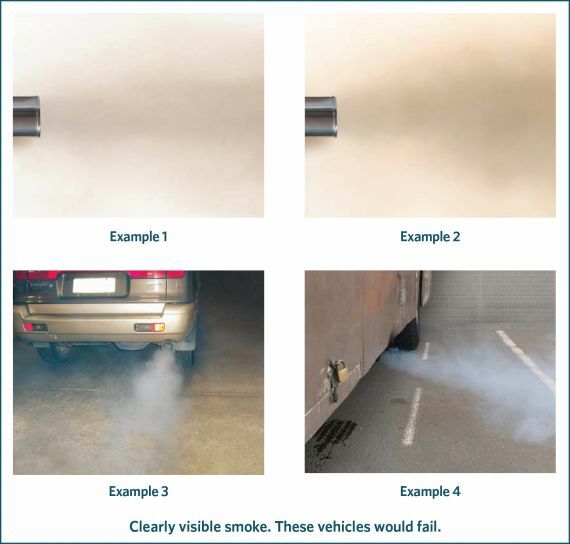 Below is some guidance on how to conduct the test as well as assistance in assessing whether any smoke emissions will cause the vehicle to pass or fail. The following test may be performed with the engine below normal operating temperature. If the vehicle fails the test, it must be repeated with the engine at normal operating temperature and purged. The test consists of a five-second idling test and a rapid acceleration test from idle to 2500rpm, or half the maximum engine speed if this is lower. With the engine idling, observe the tailpipe emissions for five seconds. While the engine is accelerated quickly from idle to 2500rpm (or half the maximum engine speed if this is lower), observe the tailpipe emissions. The vehicle inspector may require an assistant to accelerate the engine. The assistant must be appropriately instructed to avoid engine damage by over-accelerating the engine. the engine produces some visible smoke because of its design and does not emit much more smoke from the tailpipe than it would have done when the vehicle was manufactured and running on the correct fuel. The inspector may require documentary evidence that the engine produces some visible smoke because of its design. 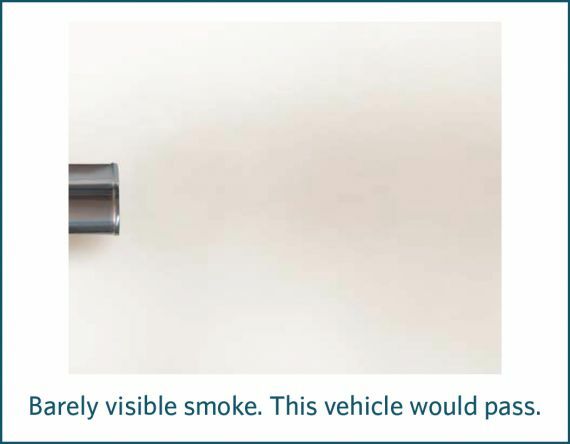 (only in the case where the engine produces some visible smoke because of its design) there is noticably and significantly more smoke from the tailpipe than there would have been when the vehicle was manufactured and running on the correct fuel. Figure 8-1-1. Barely visible smoke. Figure 8-1-2. Clearly visible smoke.